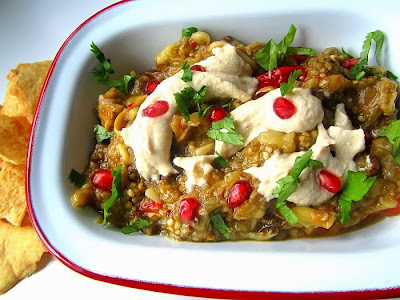 This is a twist on Baba Ganoush, that wonderful Middle Eastern Eggplant dip. I took a recipe from the book PLENTY and made it my own by roasting a head of garlic to nutty sweetness, instead of using raw garlic, which can sometimes have a bitter aftertaste. I also added a dash of cumin (my favorite dried spice in the world). During the holiday season all the dips seem to be laden with fat & calories. This is a healthy and delicious alternative to that sour cream and onion mix that you planned on serving (who are you?). This is very pretty for Christmas or New Year's, and I will be making it again in the summer with my garden's fresh eggplants and bell peppers. I am an eggplant lover, as you know, and this was the yummiest version of eggplant dip I have had. Lay the eggplant halves on a heavy baking sheet and make X scores in them. 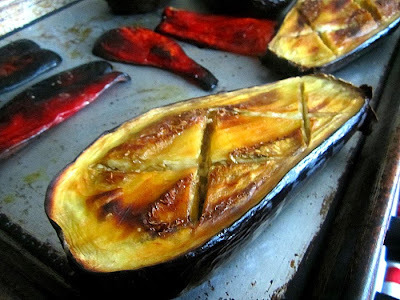 Brush the eggplants w/ olive oil and sprinkle with kosher salt. On the same baking sheet, lay the red peppers (you can also leave them whole), next to the eggplant and drizzle w/ a little olive oil. Drizzle some olive oil on the garlic head and wrap tightly in a little tin foil packet (I love the old school word "tin foil" instead of aluminum foil!). Place the foil packet on the baking sheet with the other vegetables. Roast everything at 425F for about 35 minutes, until the peppers and eggplants are getting charred. 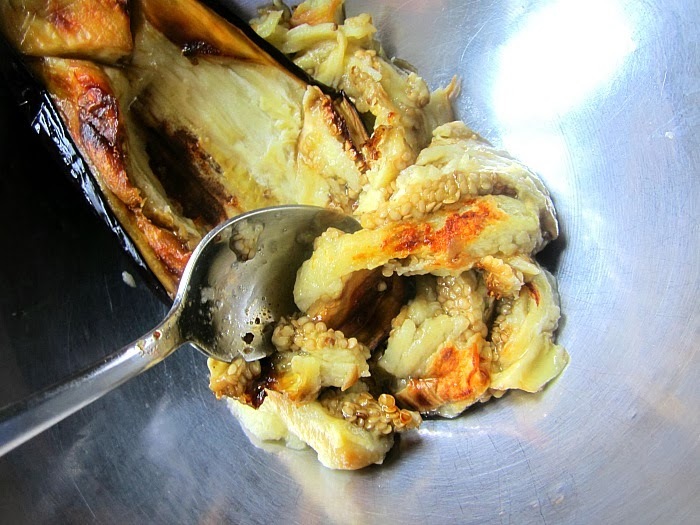 When everything is cool enough to handle, scoop out the eggplant pulp with a spoon, it will come out easily. Peel and chop the peppers and push those yummy roasted garlic cloves out of their skins, using your fingers. Place all together in a bowl and add in the lemon juice and cumin. Mix and taste for seasoning. The dip will most likely need more salt. Place 3 tbsp of tahini (sesame seed paste) over the top and swirl into the dip gently. Decorate the top with fresh pomegranate seeds and chopped cilantro. Enjoy with pita chips and try not to eat the whole thing! 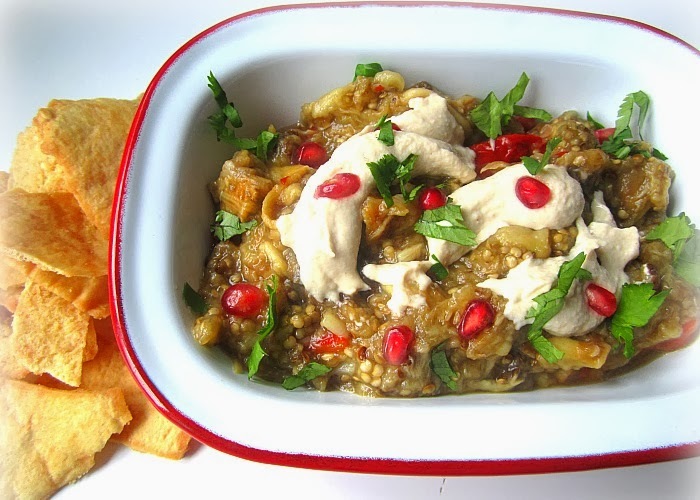 Baba Ganoush is one of my favorite dips, although I haven't added peppers before. Interesting twist, but I like the red and green you've added with this recipe to make it more festive for the holiday season. We always add about a tablespoon of olive oil on top before serving. Yum!